Erola Boix is a Spanish graphic designer with a superb portfolio that really shows off this designers talent. 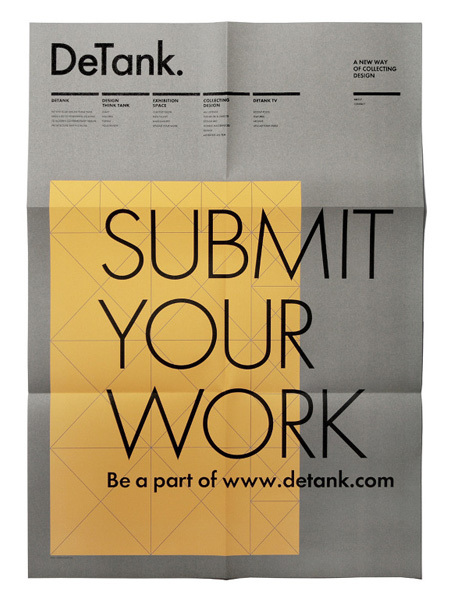 Pictured here is a promotional poster for DeTank, a design and art collectors site. Also check out the design for the Fundació Palau Newspaper. Perfection. Erola has recently moved to NYC and is looking for freelance or full-time work. 7 Comments on "Erola Boix"
What font is used for the words “DeTank.” in this image, I love it and would love to get my hands on it! @Daniel Nguyen – looks like plain old Futura Book to me. @Nic Eldrige, Oh, wow I haven’t used that in forever… thanks! People are just adjusting to him, and I think Joe needs to learn that he loses considerable effectiveness if he goes more than one inning (brilliant Boston game notwithstanding). Also, it seems like he needs to bear down more with two outs. Hes around the plate so much, and thats great, but maybe bounce some with two outs or two strikes and prey on the fact that guys are expecting him to throw strikes.